Serengeti National Park is one of the best places on earth to witness the ancient drama of prey and predator. Serengeti’s predator concentration is high year-round, yet it multiplies when the migrating wildebeests and zebras are calving in March. In March, the rolling grasslands of Serengeti gleam still in the colors of ochre. Occasional acacias dot the endless plains giving a harmonious rhythm to the sparse landscape. Wildlife is exceptionally easy to spot since grass remains short before the rains arrive. Serengeti has the largest population of lions in Africa: more than 3000 lions are roaming inside the ecosystem. 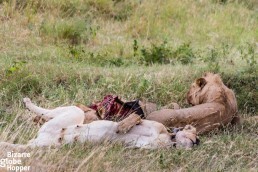 When the great migration arrives, lions binge. Wildebeests form almost a half of the food pyramid of African lions. Luckily for Serengeti lions, zebras are their second favorite catch. Whereas usually, game drive remains a game with no certain promises about the outcome, I can assure that you will see the world-renown Serengeti lions in March. The migrating and calving hooves make lions reckless and thus easy to find. 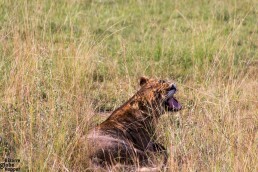 When visiting Serengeti in mid-March, we got goose bumps more than once while watching the inevitable cycle of nature. Big cats were chasing their prey and feasting on wildebeest at one spot, while a moment later we saw hyenas chopping bones loudly and fighting for their treasures. We learned to love hyenas and vultures, as they clean the kills finishing the scene. 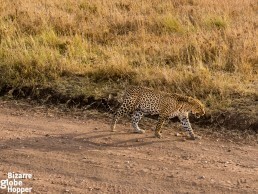 Besides tens of lions, we managed to see a couple of cheetahs and leopards on our game drives in Serengeti. 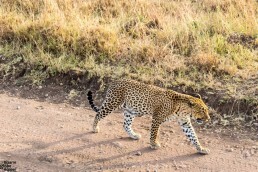 Following a pregnant leopard at zero distance for several hundred meters to its nest was one of the highlights of our safari in Tanzania. 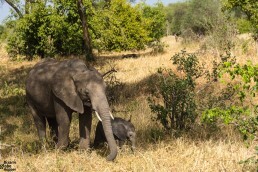 In March, you are guaranteed to see tons of baby animals in Serengeti, so be prepared for cuteness overload. We saw baby lions, elephants, warthogs, hyenas, jackals, baboons and monkeys, wildebeests, zebras, and many different antelope species. 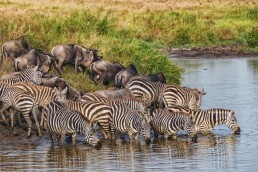 Zebras and wildebeest on a drinking hole in Serengeti National Park, Tanzania. 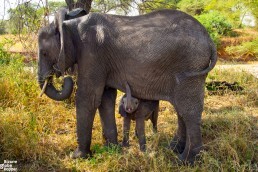 What Part of Serengeti to Visit in March? The area of Serengeti spans from Tanzania to southwestern Kenya where it’s called Masai Mara National Park. Masai Mara tends to be emptier than Serengeti National Park during March because the heavy rains have already driven the migration cross the border to Tanzania in search of new pastures. Adjacent Ngorongoro Conservation area, including Ngorongoro Crater, area also part of the Serengeti ecosystem. Whereas seasons affect wildlife viewing in the rest of Serengeti, in Ngorongoro Crater game drives are incredible year-round. As March is already low season, accommodation prices sink, and the crater is less crowded than usually. We visited Ngorongoro Conservation Area and the Serengeti National Park last March and felt blessed to see loads of animals while avoiding congestion. Although it’s hard to predict the exact location of the migration, in March it’s easier than usually. Since the hooves are calving from February to March, they tend to stay in the most fertile area available: the plains below Ngorongoro Crater. Volcanic soil offers the most nutrient-rich grass for pregnant gnus and newborn calves. 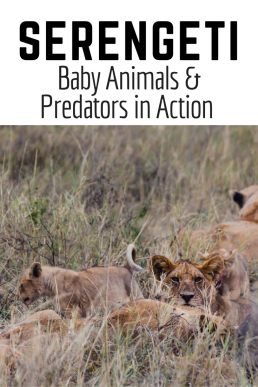 Predators follow the migration, so it’s recommendable to do the same! But How’s the Weather in March? 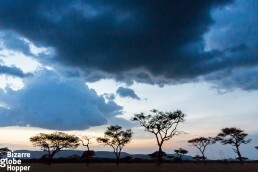 Some say that March marks the beginning of the peak rain season in Serengeti. It’s half true because the long rains tend to arrive in late-March. We stayed in Serengeti area from the beginning to the middle of March. During the time, we encountered only one shower during the night. That said, I cannot promise that it won’t rain in Serengeti during March. But even if the long rains arrive early, it seldom rains the whole day. Temperatures hover around pleasant 20–27 degrees in the Serengeti plains, dropping noticeably at higher altitudes. Sky tends to get cloud coverage toward to the end of March. Personally, I think that any timing is right for a safari – you just have to be prepared, both mentally and gear-wise. During the rainy season, it’s usually harder to spot wildlife, since long grass steals a part of your vision and migrating hooves tend to split into smaller groups. But after the first rains, the scenery will be breathtaking, and the air feels fresh. The rains also bring magical afternoon thunderstorms above the endless plains offering drastic photo opportunities. No matter which season you visit Serengeti, you simply can’t get enough of spotting wildlife and admiring the landscape. The profusion of prey species makes Serengeti a haven for big cats and an unbeaten safari destination for you – year-round. Have you visited Serengeti in March or during the rain season? Please share your experiences in the comments below! Ombeni African Safaris hosted us on a 10-day safari through Serengeti and other national parks of Tanzania, but all the views presented here remain our own. Nice Piece girls, Keep it up! !